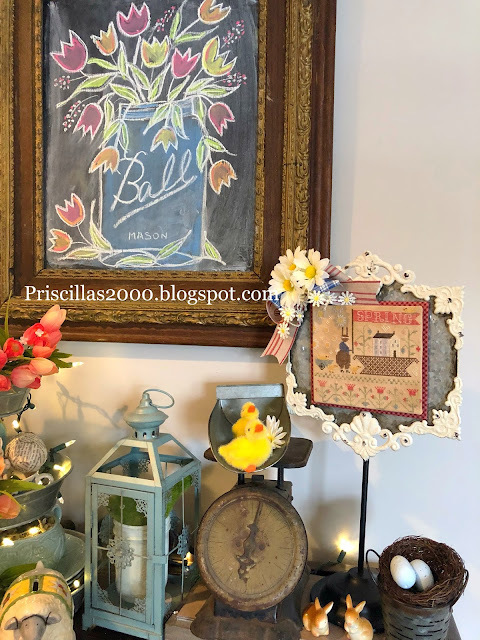 Priscillas: Daisies and A Bunny! Good morning friends! Happy Monday ! 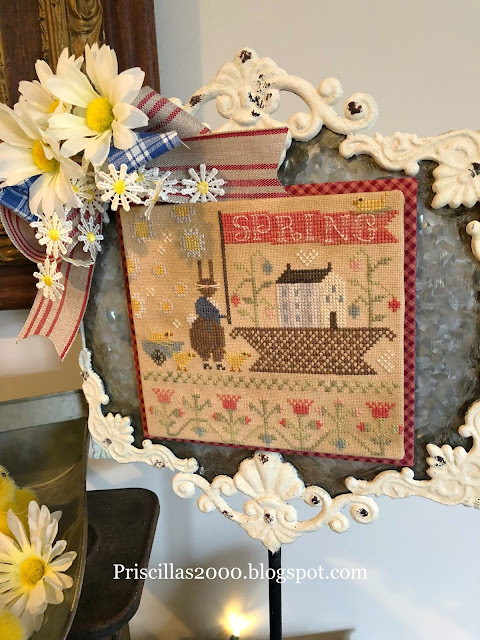 I finished stitching Basketful of Spring from With Thy Needle and Thread yesterday and finished it up this morning! 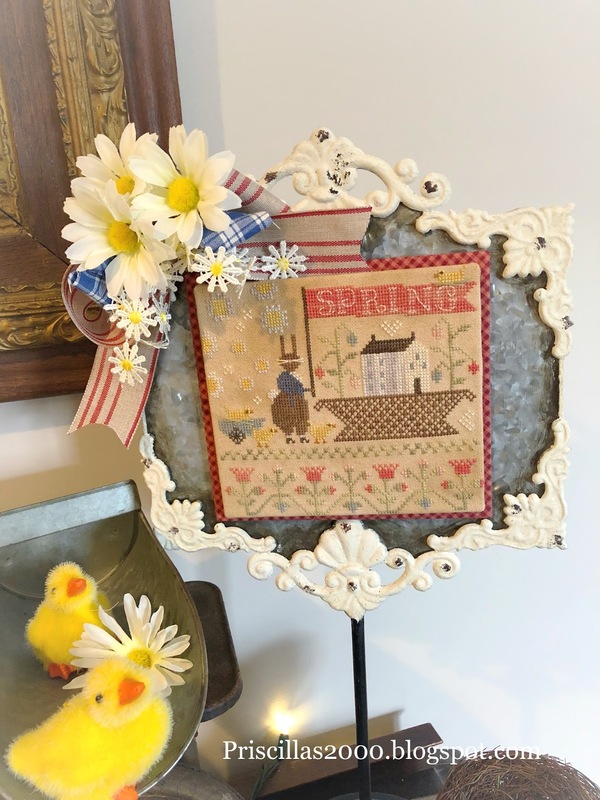 I had this ornate galvanized piece that I was using for another With Thy Needle piece SpringTime Social .. 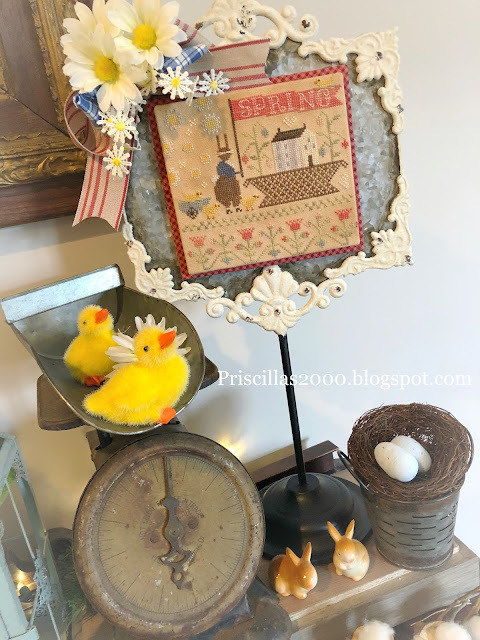 I only used it for that design and since there is already a summer basket and I am hoping a fall and winter basket this stand will get more use :) I will need to figure out a new way to display Springtime Social.. Using magnets I can switch things out with no problem! The bow is also attached with a magnet so I can add a new one for each season .. This design is so adorable ... so many little details you can't see in the photos.. This IS adorable! 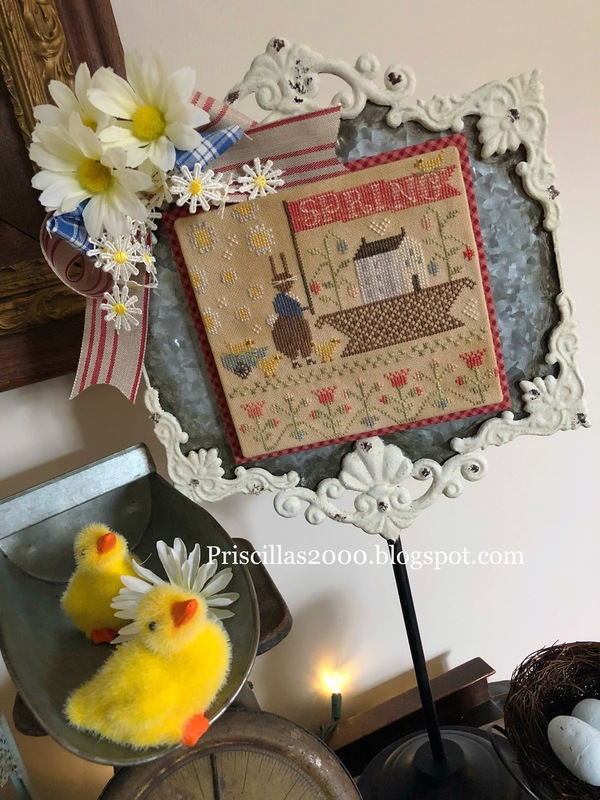 I am now picturing a little Priscilla in darling clothing with daisy trim. Too cute!! That is a really cute design. It will be fun to see if she continues with the other seasons! Awww that is just too cute! I really like the daisies... in the piece and outside of it! And the blue homespun...haven't seen that color yet! Thanks for sharing!! Hugs! I️ can never comment on your floss tube! It always gives me an error message.... so anywho I️ have a question... could you tell me what the name and designer is of the Halloween pattern that has 2 witches facing each other and it is mostly done in black? My daughter and I️ saw it on one of your floss tubes but I️ can’t remember which one! She thinks it has double trouble in the name but I️ can’t find it on any site just using that. Thanks and we love to watch each week even though we are missing out on the giveaways because of messaging on YouTube! I struggle to comment on your blog for some reason! Ronnie looks like she's guarding the Hickory Sticks. I love following you both . 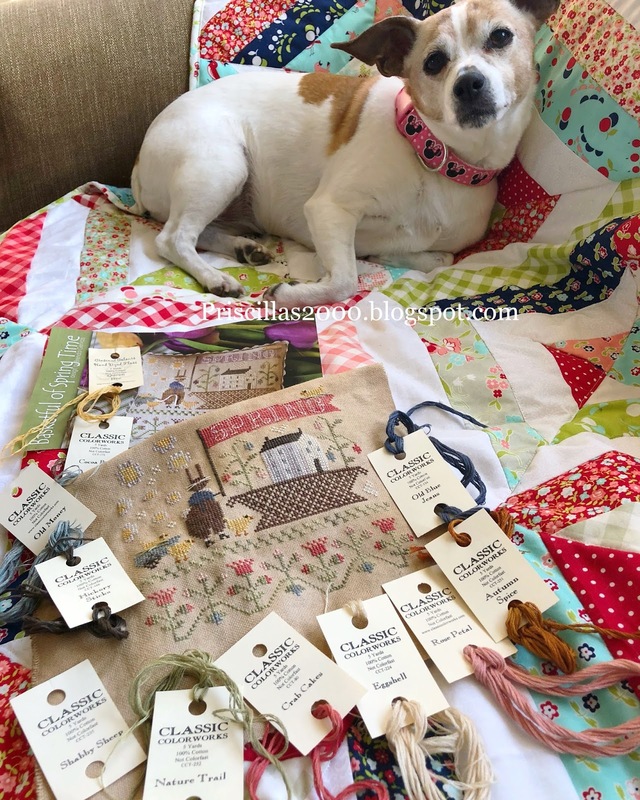 I have purchased fabric for the rag quilt but wasn’t aware that you used fiberfill in between layers until I watched your last floss tube video. What kind do you purchase? I think the one you're referring to is called Double Double by Prairie Schooler.